Is there an indoor track at the DAHLC? How long is it? 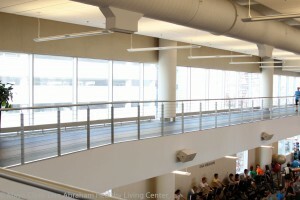 Yes, DAHLC offers a 3-lane .10 mile indoor track on our second level also called the "track level". It can be accessed via stairs or elevator. 10 times around equals 1 mile or 1.6 km. 3-lanes available for walking and running. Inside lanes reserved for walking, outside lanes for running. Direction of flow is changed daily.